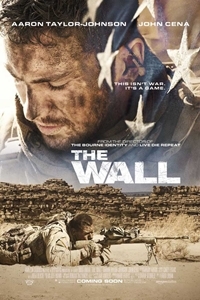 The Wall: Psychological warfare in the desert between a sniper and his target. Doug Liman’s The Wall pits two American soldiers (John Cena and Aaron Taylor-Johnson, the latter looking like Jake Gyllenhaal and talking like Casey Affleck and acquitting himself admirably) against an Iraqi sniper in the pipelined, post-war wasteland. The sniper has the clear advantage: they don’t know where he is, and their only cover is the crumbling stone wall of a former schoolhouse. But before he blows their brains out, he wants to get inside their heads, so he commandeers their communications and strikes up a conversation. Where are you from? Why are you here? etc. Taylor-Johnson plays along, hoping to buy the time necessary to rescue his unconscious and bleeding friend, tend to his own wounds, radio for help, and, somehow, locate and engage his adversary — who naturally has plans of his own. Their talk is like the desert wind: rising up and falling still, obscuring and clarifying, eddying and sweeping. Their conflicts are several: training vs. technology, resource vs. rage, and finally, guilt vs. revenge. Liman does good work in making the disembodied voice into a man, and in fitting a dialogue-heavy drama into the framework of an action film where the action is minimal but definitely not minor. Matthew Lickona: The title card for the film has “The Wall” in Arabic and English. Could you talk about the decision to include the Arabic? Doug Liman: It’s not a political movie. It doesn’t question the war, because you’re in a war, and when you’re in a war, you don’t have the luxury of questioning it. But I wanted people to think a little bit about both sides of the wall, to think about who it is you’re fighting. I’ve always prided myself on my villains not being villainous, but being rational and logical. My villains are the heroes of their own stories. When Chris Cooper is hunting Jason Bourne in The Bourne Identity, he has a very good reason for wanting to kill him. The more you understand that your opponent has a reason for fighting, the stronger an opponent they become. If your opponent has a good argument, they’re way worse as opponents than someone who has no good argument. DL: They’re not friends. They’re talking, but if Isaac can’t kill the sniper Juba, then the sniper is going to kill him. That’s the cold, hard reality of war. Juba is pissed off. He hates the Americans, and he feels he’s right for hating the Americans, and he’s going to take it out on Isaac. When he says that, he’s acting like a human being with feelings; not everything he does is consistent with everything else. He’s letting his guard down a little bit. ML: The conversation has a real ebb and flow; at times, it seems intimate enough to be almost friendly, and then, as you note, the anger comes out. Talk about working to establish that rhythm. DL: I tried to think of it as a bit like music, where you build to crescendos and you can have little interludes. That was the most challenging thing for me as a filmmaker: to start with a story that was basically a 90-page scene and break it down. To have things we’re building towards and then moments of quiet from which to start building up again. ML: Was that challenge what attracted you to the project? DL: I like making action movies because I like seeing how characters deal with the adverse situations that action movies create. The Wall puts its characters in an outrageous situation, but it’s so elegantly grounded. That’s what drew me to it: these soldiers trying to survive an impossible situation, with a sniper so far away that you’ll be dead for three seconds before you hear the gunshot.